You might have heard a lot about Mindful Eating recently. It seems to be everywhere at the moment within the health and wellness industry. You may have heard phrases like “Learn to eat mindfully for weight loss” or “lose weight enjoying the foods you love”. While it’s true that mindful eating is an amazing practice to reconnect you with the joy that eating can bring, the thing is is that lately it seems to have been hijacked by the diet industry, and is often described as a weight loss tool, or as a way to “control your weight”. When mindful eating is linked to weight loss, the true meaning and intent of mindfulness and mindful eating has been lost. Mindful eating is a practice born from the Buddhist experience of mindfulness. A Western definition of mindfulness by Jon Kabat-Zinn is “paying attention in a particular way; on purpose, in the present moment and non-judgementally”. Mindful eating therefore is the practice of mindfulness applied to eating. Paying attention purposefully and with awareness and curiosity, to the act of eating without being judgemental about what, why and how we are eating. By doing this we are able to fully connect with our body and its senses and experience the full pleasure of eating, and nourish it in a way that is serves us best. Mindful eating is about the experience and letting go of our fears and judgements we may have about eating, and our bodies – not a method of weight loss. You can see, therefore, how mindful eating and weight loss don’t fully compliment eachother. For someone who has never practiced mindful eating before, I encourage them to choose a meal, a snack, or an eating time where they may like to introduce it first. This may be a meal where they know they already are in a much calmer place, or quite a chaotic meal where they would like to be able to eat in a more mindful way. Together we discuss some strategies to support them in bringing some awareness to the meal. This might be from the time they walk in the door, it might be when they are ready to cook or prepare their meal, or it may when they are sitting at the table ready to eat. To begin with, it may not be practical to eat your whole meal or snack in a mindful way. For a lot of people, eating the first few mouthfuls of your meal or snack with full awareness and curiosity can help create some calmness for the rest of the eating experience. It also helps you practice some of the skills which will help you to eat more mindfully such as becoming curious about your needs and experiences, testing sayings or mantras to help with the experience, becoming more aware and reconnecting with your hunger and fullness, and practising letting go of judgements. For more information on mindful eating, visit the Centre for Mindful Eating. 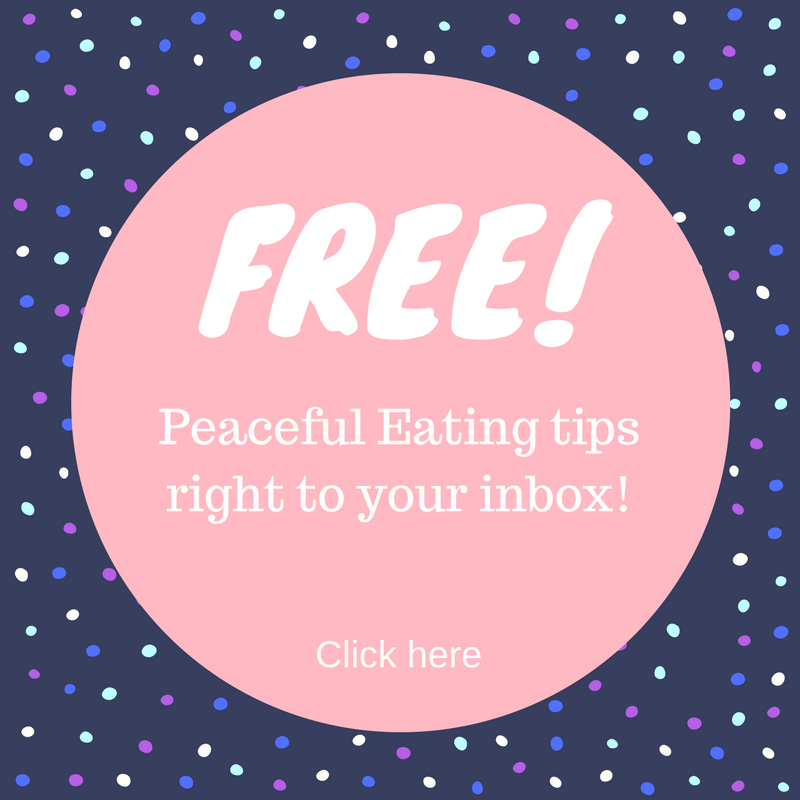 You can sign up to receive my free “Peaceful Eating Tips” printable here. To book a consultation to discuss how you can apply mindful eating, contact me. This entry was posted in Mindful eating, Mindfulness, Non diet approach, Self compassion on January 25, 2017 by eatinpeacenutritionist.